Dr. Varaphan Unachak, MD and CEO of Chiangmai Ram Hospital, explains that ‘laser tooth whitening’, even though it might sound dangerous, has nothing to do with science fiction or ‘shooting’ your teeth white but is on the contrary a soft way to remove stains, lighten pigmentation inside your teeth and remove tea, coffee and nicotine stains. It is a method by which qualified cosmetic dentists can brighten your smile in less than two hours. 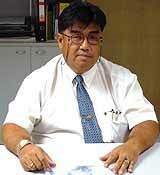 Dr. Varaphan Unachak, MD, CEO of the Chiangmai Ram Hospital Chiang Mai. Side effects are few, according to Dr. Varaphan, though there may be a little discomfort and dryness of the throat after sitting in the dentist’s chair for over an hour with mouth wide open. Watching what you eat, stay away from things which stain your teeth, stop smoking, brush your teeth twice a day for at least two minutes with a fluoride tooth paste and have a dental check-up at least once a year. The Doctor's Consultation: Dengue Fever - again and again! Despite my pleas (and those of the Public Health Department), Dengue Fever and its potentially fatal variant, Dengue Haemorrhagic Fever (DHF) is still with us. The latest figures have now prompted me to repeat my advice on this subject. If you remember reading about it before, I apologize, but the subject matter is very important. This is an important ailment that can be avoided. The mosquito lays its eggs in water containers, preferring the clean water found in water tanks and pots, in the saucers under pot plants and even under the pet’s food dish. Inside discarded car tyres are another favourite spot. These mosquitoes are not of the adventurous type and feed during the day and spend their time within 200 metres of their hatchery. Consequently, the eradication of any local breeding areas becomes very important towards maintaining your own health, as you can see. Keep your home free from lying water for a radius of 200 metres and you’re looking good! This is a crazy time in my life and I am all at sea. I have provided for my wife for the past 16 years. She has never had to want for anything. I am a model husband, good looking, never play up, only drink in moderation, don’t smoke, in perfect health, a witty intelligent companion, and I have always been considered by everyone as a “good catch”. This week she calmly announced that she wants a divorce. I can’t get it out of her as to why - just that she wants a divorce. Why, Hillary, why? I would say that the reason could just possibly be that after the same 16 years she has woken up one morning to find she was lying beside an impossible self satisfied, pompous and arrogant twit. If you were my husband, I would have divorced you too. But it wouldn’t have taken me 16 years to waked up! As far as being all at sea, don’t worry, your ship will wash up somewhere. Your type always does. Where would you suggest I take my girlfriend for a romantic night? I intend to propose to her then, so want the surroundings to make it an evening to remember. You must have all sorts of rendezvous that you could suggest. You didn’t say in your letter what it was that you wanted to propose to the young Juliet. Marriage, m้nage a trois or a dirty weekend in Tianjin? Your email also gave me no indication of where you are. What’s the use of me suggesting somewhere that’s 1,200 kilometers from where you are? If you are so indecisive and wishy-washy as this all the time, I hope she says No! to all three of your proposals. I think your advice is stupid. What right have you got to tell people what to do? Are you qualified to be handing out all this sort of silly nonsense? Why don’t you go back to your dog-house or wherever you came from? To be perfectly frank, which I’m not since I’m a Hillary, I have as much right as you have, my Petal. Since you are the one with a bone to pick, perhaps it is you that should be living in the kennel? Woof! Woof! I seem to have got myself into a little bit of hot water here, and need some words of advice from a ‘senior’ person such as your good self. I am a young single man, and considered to be not bad looking. My problem comes from one of the girls I have met recently. She rang me at work the other day and asked if I could come over and see her at the new bar she was working in. I have to admit I did not remember her from her previous bar but was embarrassed so I agreed that I would. Because I was not sure which lady this was, I never went, but now she is ringing me up every day and everyone in the office is laughing. What should I do? How can I tell her it isn’t a good idea to ring me at work in a crowded office? Any suggestions? You are far too “earnest” for your own good, my Petal! You have brought all this on your own head, haven’t you. If you don’t want anyone to ring you up, then don’t give them your telephone number! She didn’t dream up your number or get given it by the fortune teller, did she? It’s quite simple, if you don’t want a girl to ring you at work, then don’t give her your business card. If you feel the need to chat her up on the phone just give her your mobile and tell her what hours to ring you. The girl isn’t stupid. You are. And thanks for calling me a ‘senior’! Let me assure you Hillary is not eligible for any pension. You are often telling people that they should learn Thai if they are living here for some time. I have retired here, but at 65 years of age, I find it very difficult to learn a new language at my time in life. Is there any quick way of doing this, or do you have any special tips for people trying to learn this impossible Thai language? First let me say congratulations, my Petal! It’s about time some of the people out there realize that this country is called Thailand and the people speak Thai. There are many ways to learn the language. There are the set courses offered by language schools all over the country. They are used to people at your stage in life and will tailor a course to suit you, so don’t feel embarrassed. Second there is the ‘total immersion’ method. This is where you take yourself off to an up-country village, where nobody speaks English. You have to learn to survive! I have been told that by six weeks you will either be talking reasonable Thai or will have gone stark raving mad. However, it is still the quickest way to pick up a language. You will probably have picked up a small language teacher as well! Henri Cartier-Bresson, the originator of the phrase in photography, “The Decisive Moment”, has just died, a few weeks before his 96th birthday. However, he will be remembered for his contributions to photography for ever. However, despite his fame and notoriety, he was never one to look for publicity. His photographs perhaps now will speak for themselves. He was born in France in 1908 and initially studied painting, following much of the Surrealist school of thought of the time. However, by the time he was 22 years old he had dropped art for photography, but began to apply the art concepts he had been exposed to towards photography. With this concept and the portable lightweight camera, Cartier-Bresson was to become one of the principal ‘street’ photographers. A true journalist with a camera - a photo-journalist. He would record not just a parade, but also the people watching the event, and their reactions to the event. Take a look at the classic photo to illustrate the decisive moment. The shot was taken in 1932 at the Place de l’Europe, where the marooned man has finally realized that there is no way out, and having made the decision, launches himself off the ladder. 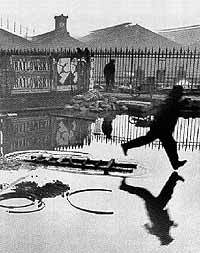 That split second, that decisive moment caught by Cartier-Bresson in such a way the viewer can feel the moment still today, 72 years later. His work took him across Europe. He recorded the Spanish Civil War in the 1930’s and then WW II, but was finally captured and he became a POW. He escaped three years later, and was there to record the liberation of Paris from the Germans. Of course, he was by that stage becoming an icon, and in 1947 joined forces with two other ground-breaking photojournalists, Robert Capa and David Seymour to form the Magnum agency. Magnum became famous for its news photography. For Cartier-Bresson, news was much more than the photo-journalists were showing. It was necessary to get behind the scenes. Cartier-Bresson and his confreres forged a name for hard hitting news photography. Cartier-Bresson spent almost 20 years there, covering Mao Zedong’s victory in China and the death in India of nationalist movement leader Mahatma Gandhi. Regarded as one of the pioneers of photojournalism, his pictures now hang in art galleries around the world, with a retrospective in Europe to be extended to allow more visitors the chance to view his work. Friend and fellow photographer Lord Snowdon paid tribute to him saying, “He was brilliant. I will miss him very much. I don’t think he’d like his work to be called art, he would like to be remembered as an anonymous figure. His books record moments that can’t be captured again.” Again that concept of the ‘decisive moment’. French President Jacques Chirac said his death was a major loss to his country. “With him, France loses a genius photographer, a true master, and one of the most gifted artists of his generation and most respected in the world,” he is reported saying. Not just France, but the world has lost a photographer who had vision and the ability to record his vision in a way the world could understand. The decisive moment will always belong to Henri Cartier-Bresson. Although domestication from wolf to dog has taken place over a much longer time, dogs have existed in our homes for centuries. The first known clear dog-like wolf living and loved by men dates back about 16,000 years. This dog was not bred for working purposes. One of the first images of dogs found on cave paintings in Spain is over 12,000 years old. 7,500 year old Egyptian pottery contains images of Saluki-like dogs. Later on their wall paintings and hieroglyphics showed also spitz and terrier type dogs. 4000 year old Babylonian sculptures show Mastiff type dogs. In China written records from over 4000 years reveal that dog trainers and kennel masters kept large groups of dogs. So is the “Fu” or ‘Lion Dog”, an ever-recurring symbol of good fortune and happiness in Chinese culture. And in Mexico a 100 BC terracotta vase was found in the form of a dog look-a-like, the present Mexican Hairless Dog. 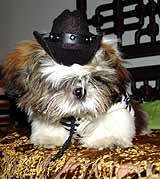 Dog breed groups have evolved in several parts of the world independent from each other. It is believed the African Basenji, the Arabic Saluki, the Chinese Pekinese, the Australian Dingo and the majority of the European dog breeds descend from the Indian Wolf. The Japanese Wolf, or “Shamanu”, is probably the ancestor of most Japanese dog breeds, such as the Akita and the Shiba Inu. And the European Grey wolf is the ancestor of many breeds belonging to the Spitz class. The now extinct Kenai Wolf from Alaska is thought to have had genetically influence on the Alaska Malamute, and the Mexican Canis lupus baileyi on the Chihuahua and Mexican Hairless Dog. For centuries dogs were mainly bred for their working purposes, such as hunting, guarding and herding, but also as a natural heater! But the hundreds of different breeds, as we know them today, are only from the past few hundred years. This kind of highly selective breeding started during the Industrial Revolution when cities developed and urban people became more and more cut off from natural world. Through a dog, this was counteracted. As in the cities the original tasks of the animals were no longer needed and cruel sports such as dog fighting and bull baiting became forbidden, dog lovers needed to find some new roles for their pets. And so the first dog beauty competitions were arranged in pubs in the eighteenth century. Within a century this had lead to fully organized dog shows with fixed standards, and pedigree dog breeding, keeping and showing. I was reading a very interesting article about why we shouldn’t blame Microsoft entirely for the problems we face with badly developed software. Microsoft has carried the blame for many things that go wrong, but this also explains some of why we should also consider another culprit. Our tech colleges and universities. While I was reading this article, my mind was saying - well that’s so obvious! and Yes! and so on, as I read each statement. I want to share some of this with you. Think about this. How many “bugs” (problems) have been discovered in current versions of commercially oriented software (e.g. word processors, web browsers, databases etc) by the vendor? I think you’ll find the answer is somewhere between none and very, very few. Compare this with the number discovered by customers (you and me), and unfortunately “hackers” in all disguises. Once a product is released, the software vendor only wants to focus on the next release. With any luck, there will be lots of reasons (bugs!) for customers to want, or need, to upgrade to the next version. Best of all, the vendor doesn’t even have to go looking for these bugs - everyone else is doing the job for them. The business model for most software vendors not only encourages this behaviour, it actually relies on it. Why on earth should a vendor go looking for bugs in current versions? There’s no money in that. In fact, it pays to write poor code, just not too poor. Digging a little deeper, what motivates vendor senior management. Senior management are rewarded by how well they achieve the business model objective. Mid-level managers and software developers are pressured from above to create the best software possible and still meet release deadlines that often have everything to do with marketing requirements and not coding requirements. Programmers are usually rewarded for the quantity not the quality of code. After the programmers have finished, the beta version is passed to testers. The focus of testing is to prove that the programming does what is claimed it will do. Not enough time, if any, is spent proving that it doesn’t do what it shouldn’t, security holes is one example. There’s also an implied pressure on the testers - don’t find too many bugs - you’ll make the programmers look bad! The new software will be developed in accordance with internal design requirements, tested against these requirements and marketed by people who turn obscure facts into major features. Have you ever tried telling a marketer about limitations? So far, testing has been done by people with a vested interest in not finding bugs. Last of all, the real expert gets involved. The user (you and me). Let’s step back a bit more: what about the programmers themselves? Teaching institutions turn out programmers who are very good at writing “good enough” code. After all, if it’s good enough to get a pass, what more do they need to do? These institutions have to produce graduates who are well rounded and able to enter a variety of IT careers; there’s insufficient time to do much else. How many of the best hackers have attended university? Most of them probably aren’t even old enough! I think great programmers are usually self-taught and often come from a hacking background. If you’re good at finding vulnerabilities in someone’s software, you’re probably going to understand how your own program can be attacked, and can then write code taking that in to account. Lastly, there is an interesting article by a senior scientist at TruSecure, in which he argues that programmers are largely victims of the tools they use. Most tools are intended as “rapid development environments.” However, the faster you develop software, the harder it is to debug, especially for security. He also notes that when the tools try to promote security-aware programming, the programmers do their best to defeat the tools! Obviously, the principal reasons software development is rushed is to beat the competition and make money - to be sooner on the market and to be more feature-rich. Think about it. How happy would you be if the engineers designing a new suspension bridge were rushed in their design and construction work, only to find they needed to release a second version one year later? My thanks to the Sydney Morning Herald for the background to the article above. Dr Byte appears in Chiangmai Mail every 2 weeks and if you have any questions or suggestions you would like to make, you can contact me at Dr Byte, Chiangmai Mail. In the next column read my answers to the many questions from readers about their frustrations with their computers at home and at work. It is popular notion, that beer influences positively the appearance of skin and hair, and this by its intake as well as its external application. Beer beautifies. Routinely applied, beer does more than any shampoos can. Beer provides strength and makes hair lavish and bouncy. The secret of this reaction is the beer’s astringent qualities, resulting in the contraction of individual hairs. This in return provides a more solid texture and increases the volume of the hair. Egyptian women, reported the Roman writer Pliny 2000 years ago, use the foam of beer to improve their complexion. What persuaded them to choose beer and not another beverage is not known until today. Modern cosmetics are unthinkable without the utilization of beer. Creams are already in the markets which take their effectiveness from the high vitamin content of beer-yeast. Unhappy teenagers in puberty with their skin problems, are profiting from these creams. Next time you walk through one of the department stores cosmetic region check it out yourself. Continuing our mini-series on the views imparted by Scott Campbell, the portfolio manager whose ‘Growth Fund’ has been judged by S&P to be the best in its sector for the last 6 years, during his first ever visit to Bangkok, last month we turn our attention, once again, to Warren Buffett. It is that time of the year when Warren Buffett reveals the annual results of his company, Berkshire Hathaway and also provides his insights into current trends and investment issues. Consider the facts and it is easy to understand why so many wait in anticipation for this commentary and his legendary annual general meeting in Omaha in May. Over the past 39 years book value of Berkshire has increased 22.2% compounded annually. NAV per share was US$19 in 1965 and is now US$50,498. Shares trade at nearly 2 times book or US$100,000 per share. Total results versus the S&P500 are awesome since 1965, but probably more impressive to me is the out performance in tough times. The table above depicts Berkshire’s annual percentage change in per share book value versus S&P500 with dividends reinvested. The startling historic fact is that intrinsic value has somewhat exceeded the 22.2% pa book gain? Enough of the history, everyone knows Buffett is a GURU. Where is he positioned today and what are his current views? Berkshire has 4 main investment sectors, insurance, operating businesses, finance and common stock investments. When valuations are similar they strongly prefer owning businesses to owning stocks and the latter has decreased in percentage as stocks become the far more expensive choice. In recent years they have found it hard to find significantly undervalued stocks with 1) favourable and enduring economic characteristics, 2) talented and honest management and 3) are available at a sensible price. 2003 was a terrific year for their insurance businesses. They produced an underwriting profit of US$1.7bn and had the use of US$44bn of “float” assets. GEICO continued to prosper and the reinsurance company, General Re looks to have turned the corner. Following on from last year’s thesis on derivatives, General Re is still trying to exit all derivatives activities since 2002. It has cost US$173mn in 2002 and US$99mn in 2003 to shrink this business but more importantly in early 2002 it had 23,213 outstanding contracts with 884 counterparties (some having names that Buffett couldn’t pronounce let alone evaluate creditworthiness). Despite a concerted effort, they still have 7,580 outstanding contracts with 453 counterparties! These losses have come in a benign market; all contracts were previously valued market to market and without any major credit loss. Buffett cautions again on the shenanigans of derivative accounting and what is lurking in the undergrowth, indeed the more you learn the less you know from disclosure documents. The scary thing about all this is the sheer gigantic size of the unregulated OTC derivatives market place and that General Re has taken these hits in an orderly market. What happens if a financial crisis forced a number of derivative dealers to cease operations simultaneously? Reported profits are illusionary and Buffet notes that the cash needed to prop this business up in the tough times, would be exactly the time they wanted to deploy that very cash into other assets at huge advantages. They remain convinced that derivatives are financial weapons of mass destruction, carrying dangers that, whilst now latent are potentially lethal. All Berkshire’s boring businesses performed well in 2003 and they made a major acquisition in manufactured housing, brought a distribution business from Wal-Mart and continue to grow MidAmerican Energy Holdings. Existing businesses such as Flight Services, Shaw Industrial and Fruit of the Loom are in good shape. The common stock investment portfolio remains dominated by Coca-Cola, American Express and Gillette and they are neither enthusiastic nor negative about the portfolio they hold. Buffett is annoyed that he didn’t sell several of the larger holdings in The Great Bubble. In 2002 Berkshire purchased US$8bn of junk bonds or high yield debt because they felt it was cheap. He notes that the pendulum has swung quickly and this sector looks decidedly unattractive to them. Yesterday’s weeds are today being priced as flowers and an exit strategy is in progress. Finally, Buffett is critical of US corporate governance, the US trade deficit, US$, mutual fund directors and un-repenting CEOs. His cash pile of US$36bn (US$12bn is in foreign currencies for the first time) is only earning a pittance, but he is prepared to under-utilise capital and be patient as it is way less painful than doing something stupid. A very wise man indeed! I can’t believe school started already and I am already in Grade 4. How did you spend your summer holidays? Probably like every other normal people with sunbathing, swimming, and enjoying yourself. Maybe a few of you went to a holiday club or somewhere where you could do a lot of activities. That’s where I spend my holidays this year. We were 144 kids and had our own kids club with lots of things going on all day. One day of the week we had a kids’ night where we performed dances, sketches, an acrobatic show and so many other things. We practiced two whole afternoons, the, I call them ‘teachers’, gave us costumes and showed us how to put on stage makeup. It was so much fun. I wish somebody in Chiang Mai would open a group like that for children. Adults always think children are too small to perform but we had 3 year olds who did a flower dance, and they looked so cute. One was the sun and the others where the flowers, always dancing when the sun stood up and ‘sleeping’ when the sun left the stage. I believe we could do something similar in Chiang Mai as well but once again we need adults for guidance. I mean mums and dads to start, help and sponsor. May be You could talk to YOUR mom and we children of Chiang Mai can get a small international theatre group together. Think about it and may be you want to write to me. See you next week, same newspaper, same page. Why did the man throw the butter in the sky?